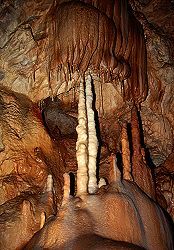 Image: one of the numerous formations. Location: Chişcãu. National Road 76 (DN-76) Oradea-Deva, at km 86, in Sudrigiu, Local Road 763 (DJ-763), 16km asphalt road. Open: All year Tue-Sun 9-17. Dimension: H=482m asl, T=10°C, L=1500m. Address: Peştera Urşilor, Chişcãu, Tel: +40-744-638-244. 17-SEP-1983 discovered during quarry works in the marble quarry of Chişcãu. First explored by Curta Traian. 14-JUL-1986 opened to the public. Peştera Urşilor means Bears' Cave. 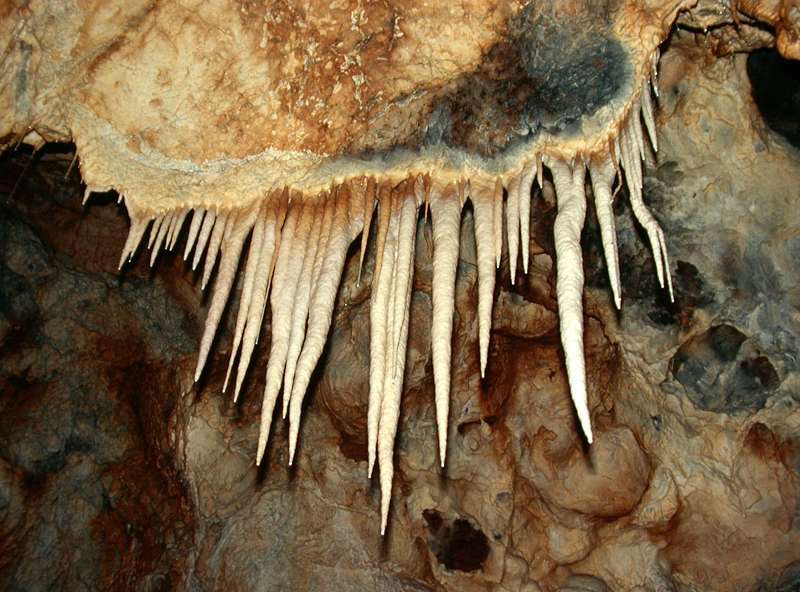 The cave was named so, as numerous cave bears (Ursus spelaeus) were found in this cave. The lowest sedimentary layers, which contain bones of cave bears, were dated to be between 40.000 and 45.000 years old. The cave was visited by these large animals regularly until some 15.000 years ago. At this time a rock slide closed the entrance. There is a theory that there were still more than 140 bears inside the cave. Becoming hungry, the bears killed one another until all were dead. 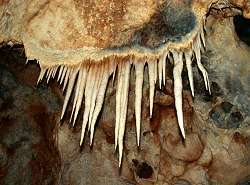 This story is told by their remains, bear bones of 140 individuals covering the floor of large parts of the cave with the marks of bear teeth. However, most of the bones were deposited over the tens of thousands of years before. Now the cave was undisturbed until 17-SEP-1983, when the cave was discovered during quarry works. The marble and limestone of this area was mined by the inhabitants of the nearby village Chişcãu. So the rediscovery of the cave after a blast, was only a matter of time. The first one who visited the cave was the quarry worker Curta Traian from Chişcãu. 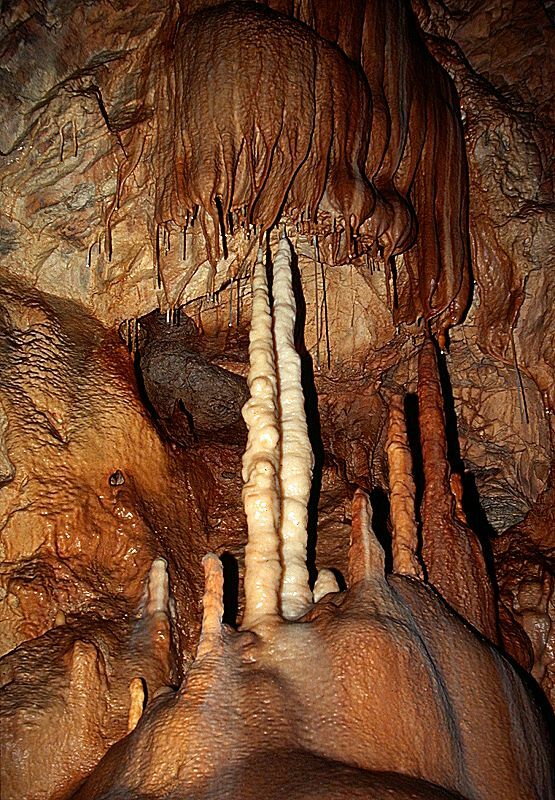 Peştera Urşilor is the only modern show cave in Romania, with paved paths, banisters, and electric light. This was a sort of experiment, to test if show caves are interesting for tourists. But although this experiment worked very well - the cave attracts more than 200.000 visitors every year - it is still the only well developed show cave in Romania. And this may stay so for the next time, as Romania is probably the poorest country in Europe, still suffering from 40 years of socialist Ceaucescu regime. Search Google for "Ursilor Cave Bear"